I’ve been thoroughly enjoying James Maliszewski’s descriptions of his old copies of Ares and Dragon magazines. It’s long been in my mind to do something similar for some of the wide range of British gaming magazines in my collection (and some of the old games in my collection as well). I won’t claim to have every British prozine published, nor did I have every fanzine (far from it) – and what’s more, I can’t find a single copy of an ’80s fanzine in my collection any more. Somewhere in my travels, a boxload of them has vanished. Ah, for such lost treasures as The Beholder and Drunk & Disorderly. When it comes to British prozines, the biggie was White Dwarf. The first issue in my collection was issue 27, dated October/November 1981 (it was bimontly in those days, though this issue announced plans to go monthly). At 36 pages, it was very thin compared to Dragon, and considerably cheaper at 75p. The editor at this time was gaming legend Ian Livingstone, co-founder of Games Workshop, author of Fighting Fantasy gamebooks and currently Life President of Eidos Interactive. 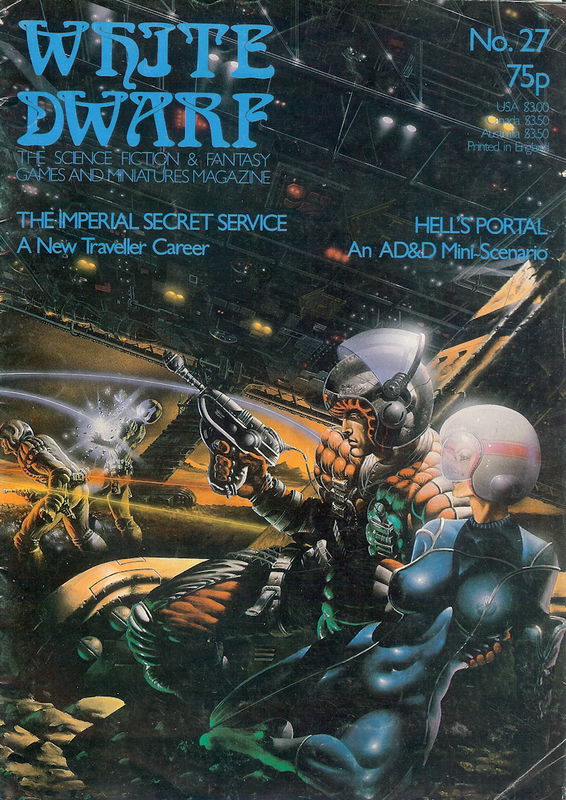 Ian edited White Dwarf from the first issue through to issue 74 (1986). My copies of issues 27 and 50 are signed by Ian, who I met at Games08, Dubai’s first video game conference. The articles in this issue are varied, but somewhat typical of their day. The Moldvay edition of Basic D&D had not long since been published. RPGs were just about to explode in popularity. The content (and date) puts it in the tail end of the Golden Age of D&D (or the Electrum Age, if you prefer), according to Maliszewski’s Three Ages of D&D. The dungeon is still the adventure of choice, but people are beginning to move away from the gonzo style of the true Golden Age. I sometimes wonder how applicable the Three Ages are to the British experience; in their broad sweep I think they hold, but I think we had our own flavour of gaming, quite distinct from the American one. I bought this copy from Woolworths a few weeks after my 13th birthday, along with my first copy of the Traveller rules – yes, Woolworths stocked not only RPG rules and magazines, but even had some miniatures. Alongside the Airfix kits and plastic toy soldiers in 1/36 (54mm) and 1/72 (25mm) scale, maybe that didn’t seem too odd. I’d been introduced to D&D (the Holmes edition) a couple of months earlier, and had asked for (and got) a copy of the Moldvay edition for my birthday. When I saw this, I’d never heard of White Dwarf, but the cover (by Alan Craddock) was great, and it had articles on how to play these extraordinary games I was discovering. I kept buying the magazine until around issue 90. I’m going to be a little indulgent, and list each article in the issue. I don’t intend to do this when I come to later issues. A two-page article, the last of a three-part series by Roger Musson (the whole series was reprinted in The Best of White Dwarf Articles Vol II), presents a series of themes for dungeons. The first, the Cybernetic Dungeon, discusses random generation, and even mentions a piece of home-grown software, The Musson Mark II Cybernetic Dungeonmaster Computer Program. I have no idea whether this actually existed, but if it did, it must count as one of the earliest bits of RPG software. Other themes are the Improvised Dungeon (making it up when PCs reach a part of the dungeon you haven’t properly prepared yet), the Silly Dungeon, the Rewarding Dungeon (emphasising maps, documents andf adventure leads as much as magic and treasure), the Vagrant Dungeon (wherein the monsters move around) and the Ecological Dungeon (carefully planning the dungeon’s inhabitants as an ecosystem – this gets 3 whole paragraphs). A single-page article by Robert McMahon gives a new Traveller career: the spy, in the format of the advanced careers introduced in Mercenary and High Guard. I recall rolling up a few characters from this career, and they were reasonably well balanced against the official advanced careers. 1. Deluxe Edition Traveller reviewed by Andy Slack. He notes several minor differences from the earlier edition, and rates it 10/10 for newcomers and 4/10 for old Traveller hands. I’d just bought the older, non-deluxe edition, but I don’t recall being upset I’d missed the deluxe version. I loved the game I’d bought. I still do. 2. Griffin Mountain, reviewed by Murray Writtle, who gives it 9/10. This has gone on to be one of the most highly regarded Runequest campaign packs. I didn’t own it at the time, though my RQ GM did, and I played in it quite a bit. I now have the hardback Moon Design reprint. 3. Star Fleet Battles, reviewed by John Lambshead, who notes that although it’s moderately complicated, it does give the feel of controlling a Star Trek ship and gives it 8/10. 3. IISS Ship Files and Traders & Gunboats, reviewed by Robert McMahon. The former is a Games Workshop booklet, which McMahon gives 10/10 (I lost my copy years ago, but do recall being impressed with it), and the latter, of course, is Supplement 7, which gets 9/10. 4. Asteroid, reviewed by Bob McWilliams, a GDW pulp SF boardgame, which McWilliams gives 8/10, describing it as fun melodrama. I never owned this game, nor saw a copy of it, but apparently it concerns the efforts of a shipful of amusing characters who must stop an asteroid hitting Earth. A single-page article by Lewis Pulsipher, who seemed to contribute to just about every issue of every gaming magazine I read in the early ’80s. It’s an early attempt to describe roleplaying as opposed to gaming – the kind of thing that culminated in Forge Theory, and it’s interesting to note that Pulsipher identifies two kinds of player – those who create ‘personae’ and play them in character, and those who collect loot and experience. Nothing wrong with either approach, Pulsipher says, and notes that both types of player can play in the same game “though with some friction”. It’s also interesting to note that at this stage, the definition of Chaotic alignment revolves around randomness and unpredictability. Pulsipher notes some players roll dice to see what their Chaotic character might do. If they don’t want to do that, his advice for ensuring unpredictability is to require players with Chaotic characters to make snap decisions about their character’s actions, but allowing Lawful players some thinking time. Marcus L. Rowland’s follow-up to The DM’s Guide to the Galaxy discusses D&D in space – in this article, melee combat in freefall, ship-to-ship combat, and how certain D&D spells function (or don’t) in space. All in one page, and several years before Spelljammer became a hit. I have to say, I had no use for this article at all at the time; I had no time for science fantasy, and I had Traveller for science fiction. The opening letter asks for advice on how to handle a vampire PC in D&D – and has a somewhat old-school response from Livingstone (play to the disadvantages of vampirism, and force the character to adventure alone as he’s now Chaotic Evil). Interesting that of the three letters published, one was from Cadiz, Spain, and another from Hong Kong. An AD&D scenario “for 7-9 characters of around 4th level run by experienced players” by Will Stevenson. It’s a map and room key style dungeon crawl, with the twist that an NPC unit, the Imperial Task Force, is looking for the same relics the party’s been hired to find. And 7-9 characters? Wow. That number of players makes me nervous these days – but these were the days when it wasn’t uncommon for one player to play several characters, or even an entire party, so this could have been run as a one-on-one. The regular Traveller column contains Bob McWilliams’ idea for speeding up Traveller combat by preparing index cards for individual weapons. I found it one of the most useless articles – a one-sentence idea stretched out to fill a page. The idea of index cards must have stuck with me, though, because I soon started using them to record and file handwritten NPC and monster stats. It worked well for D&D, AD&D and Traveller, though RuneQuest characters might get a little cramped. I’ve just been scouring stationary shops for a replacement index card box, only to be disappointed. A new AD&D magic-user subclass by Penelope Hill. It’s pretty much a one-trick pony, and it certainly didn’t ever appeal to me to play it or make an NPC one. I can think of one of my current loose group of players who’d love it though. Fiend Factory was one of White Dwarf’s regular columns, edited at this stage by Albie Fiore, featuring a batch of new AD&D monsters in every issue. An oddity was the use of the Monstermark in statistics – this was an early (and highly mathematical) attempt to assess a creature’s Challenge Level, developed by former Fiend Factory editor Don Turnbull, who at this stage was running TSR UK. 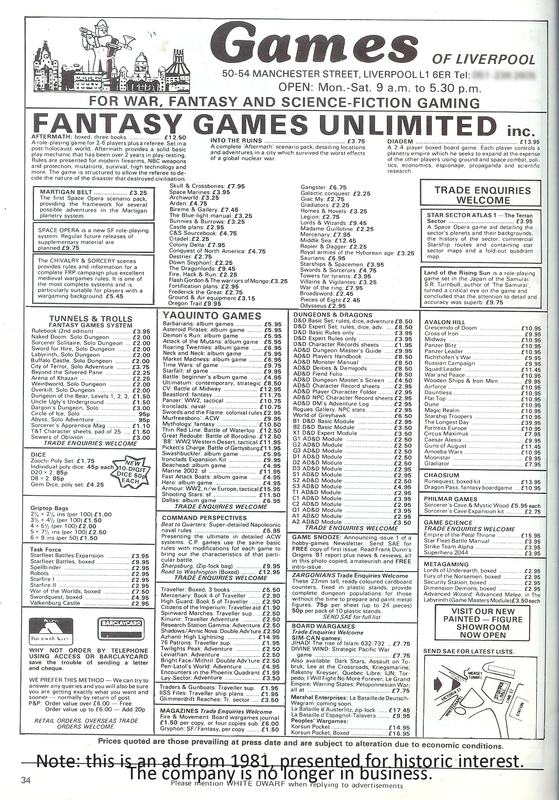 This issue, the creatures are some of those that nearly – but didn’t quite – make it into the first edition Fiend Folio (which was developed by TSR UK, soliciting contributions from gamers through White Dwarf). Another regular D&D/AD&D column, treasure chest was a collection of magic items, traps, treasures and ideas DMs coul dplug into their game. White Dwarf at this stage presented snippets of news and gossip in the style of a British tabloid newspaper. Of note on this page (besides the photo of Ian Livingston attempting to throttle a cyberman) was the article on Joe Dever’s siege demonstration at the Dragonmeet convention. Joe became something of a fantasy wargames legend in the ’80s, and went on to write the Lone Wolf series of gamebooks. Reading old magazines carries a hidden delight for me. I love looking at the old adverts, pushing items long out of print from shops no longer in existence. Even back in the day I used to read them avidly, working which I’d spend my pocket-money on. I hadn’t found a games shop at this stage, though, and I already had most of what Woolworth’s was selling. This issue has the regular ads from Games of Liverpool (see below), Esdevium Games (a mail-order company), and the Crasimoffs World PBEM strategy game, alongside ads from Games Workshop and related companies like Citadel Miniatures. 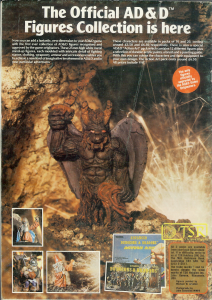 The back page ad is for the official AD&D miniatures, with a huge photo of a balrog so ugly that when I first ventured into buying miniatures I got some Chronicle ones via mail order. I never did buy any official AD&D miniatures. Games of Liverpool, or Games as they were known in Leeds, would become a regular haunt of mine once they opened their branch in Leeds’ Merrion Centre. I’m scanning their full-page ad in because it gives a pretty good idea of what was available to UK gamers in late 1981. Click it to enlarge. Games of Liverpool advert, Oct/Nov 1981. Click to enlarge. This entry was posted in Gaming and tagged old school, tabletop, White Dwarf. Bookmark the permalink.